The trouble with trying to protect migratory species is that, well… they migrate - often beyond the areas where protection is implemented, and even outside the jurisdictions of States that are trying to protect them. Even with the best protection implemented in part of a migratory species range, if they are overexploited somewhere else, or their habitat elsewhere lost, the situation for their continued survival can be grim. International collaboration is a must. In 1983, the Convention on the Conservation of Migratory Species of Wild Animals, also known as the Bonn Convention or CMS for short, went into effect. Whether a species lives on land, in the ocean, in fresh water, or flies in the sky, if it migrates and is at risk, it could be eligible for listing under the CMS. Species listed under the convention are placed into one of two Appendices (or sometimes both). These Appendices guide what sort of protective measures should be implemented by States that have signed up to the CMS. Appendix I is reserved for the most threatened species - those in need of immediate and effective conservation to prevent their extinction. States that have an appendix I species in their jurisdiction are responsible for enduring the species is strictly protected. This means that they have to conserve and restore the animals' habitat (if needed), remove any obstacles that might stop the animals migrating, and prohibit any take of the animals (though some very limited and exceptional circumstances can be applied). Appendix II is for those species that are threatened, but not as critically as those in Appendix 1. These species will also benefit from some targeted conservation actions to prevent their populations getting into an even worse condition. Signatory States who have an appendix II species in their jurisdiction may want to apply some of the strong protection as they would if the animal was listed under Appendix I, but the main focus is for States to cooperate with each other to ensure their animals are protected. Agreements can be legally binding agreements between States, or they could be less formal agreements or even action plans. In Manila on October 28, 2017, the 12th session (meeting) of the CMS concluded. Amongst other things, signatory States (there are 129 of them) voted to add 33 migratory species to the CMS. Let's take a quick look at the 9 marine species that have been newly listed under the CMS this year. As their name suggests, Caspian seals are found only in the Caspian Sea - which also happens to be the World's largest inland sea! They are also the only marine mammal found in the Caspian Sea, which makes them even more special. Thanks to hunting (including illegal poaching) and continued bycatch (where the seals are accidentally caught by fishers trying to get something else), the seal population dramatically declined, giving it an Endangered status on the IUCN Red List. By listing the Caspian seals on the CMS the Government of the Islamic Republic of Iran, who proposed the listing, hope that it will force the States which fall in the seal's home range to implement conservation measures. Who are these States who need to do better? Azerbaijan, the Russian Federation, Turkmenistan Kazakhstan, and Iran. Yes - Iran listed itself as needing to implement conservation measures! Although Azerbaijan and the Russian Federation are not CMS signatories, the hope is that they will do their bit as well. Iran even highlighted an economic benefit to protecting these seals - enabling "artisanal fishers to benefit from the much more lucrative and sustainable tourism revenues this species generates". As the world's largest living fish, the whale shark is amongst the most well-known of the marine species listed under the CMS this year. There are two sub-species of whale shark - an Atlantic population and a Pacific population. Both populations are considered Endangered under the IUCN Red List. Although whale sharks are already listed under Appendix II, the proposal for listing the whale shark under Appendix I, which was put forward jointly by the Governments of the Philippines, Israel and Sri Lanka, was born out of a need to provide better protection in key aggregation sites as well as along migration corridors. As they point out, many of these sites fall within the jurisdiction of other States, and not just in the high seas. There are a number of issues that States could tackle within their own jurisdiction to help whale sharks. These include bycatch reduction measures and minimising the risk of vessels hitting whale sharks in the water (whale sharks feed just under the surface of the water on plankton, making vessels quite dangerous to them). The governments also highlight that tourism can have a detrimental impact on the whale sharks if not done with care, and marine pollution in some areas is also putting the animals at risk. The angelshark (Squatina squatina) (Appendix I and II). The angelshark carries the far from fabulous IUCN Red List status of Critically Endangered. As with most fish species that are listed under the CMS, the reason for the state of its population is overfishing and bycatch. Today there is little in the way of targeted fishing of angelshark, but being a benthic species (living close to the sea floor), the shark is highly susceptible to bottom trawls and bottom longlines. However, the Government of Monaco who put forward the proposal to have the species listed, highlight it is not the only threat. Scuba diving at the last few spots where they gather in 'large numbers' like nursery grounds may disturb the animals. In these same spots, recreational anglers may find themselves hooking an angelshark. On the upside, if recreational fishers quickly and carefully release the sharks they catch, their chance of survival may not be too bad. Angelsharks do have some better protection across its range than many other species listed under the CMS already in place. These include no-take marine protected areas and fisheries management measures. The problem is that these protection measures are not spread equally throughout the shark's range. As for recreational fishing and scuba diving, well these are generally poorly managed for the shark everywhere, and there is little effort made to try and help people minimise their impacts. As with all migratory species, coordination of conservation measures is key. As the Government of Monaco note, "Any national conservation initiative intended to prevent this Critically Endangered species from being driven further towards extinction is unlikely to be successful if the animal is not protected during its seasonal migrations through other range States’ waters". This large shark, which is found in tropical, sub-tropical, and temperate seas, only has pups every 2 to 3 years, making it one of the least productive of all sharks. This means that it takes longer for the population to recover from declines than other shark species, which in turn makes it more vulnerable to extinction. Fortunately, dusky sharks are not in a critical condition just yet. They are currently listed as Endangered under the IUCN Red List, though it's worth pointing out that many of the populations have not yet been assessed, and for others, we have too little information on them to make any strong conclusions about their condition. In their proposal, the Government of Honduras points out that a number of scientific studies suggest that the population as a whole has seen huge declines over the years. Protection of key habitats for the sharks, including nursery grounds, is largely lacking across most States that make up the shark's home range. Whilst this has raised concern, the primary reason for the decline according to Honduras is "a lack of wise management". What they are talking about here is fishing. In some cases, fishing is completely unmanaged. In other cases, fishing is managed but is unsustainable. Of course, there is also the issue of bycatch. Sadly for the dusky shark, even if they are released after being accidentally caught, they are not likely to survive very long. The Honduran government aren't suggesting that fishing of dusky sharks need to stop - rather than collaborative management of signatory States could result in sustainable fisheries. Currently, Honduras bans "the retention of all shark species". With its IUCN Red List status of Near Threatened globally and Critically Endangered in the Mediterranean, this highly migratory shark (actually one of the most 'highly migratory' fish species in the world) has seen declines across the world. The primary cause - unsustainable fishing - both legal and unregulated, and as bycatch. 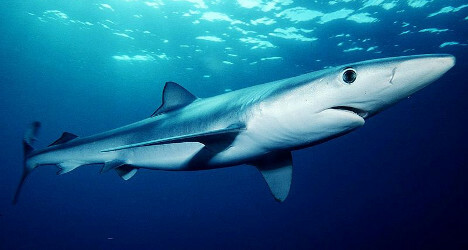 This has given the Governments of Samoa and Sri Lanka sufficient concern to put forward their proposal for the blue shark to be listed under the CMS. "There is no disagreement, however, over the urgency of introducing management for this species; unfortunately no large-scale collaborative/regional management actions currently seem likely, other than those delivered through shark finning bans. The Blue Shark is certainly in urgent need of collaborative management by range States and through regional fisheries bodies, but appears not to be a high priority for action at present. A CMS Appendix II listing could help to drive the improvements in national and regional management that are required if this species is to be managed sustainably". Hopefully, with both Samoa and Sri Lanka keen to take the reins in developing international blue shark conservation policies and the proposal accepted, the blue shark will begin to see better days. Found in the coastal waters of Southeast Asia and Australia, the whitespotted wedgefish, actually a shark-like ray, has suffered from overfishing. The result - an IUCN Red List status of Vulnerable, and an accepted proposal put forward by the Government of the Philippines to have the species listed under the CMS. Outside of Australia, this wedgefish is highly prized by both commercial and artisanal fishers for its fins, which collect a high price in Asian markets (Australia bans all shark finning). With a lack of regulation, the value of the fins, and the vulnerable state of the species the Philippine government fear that without international protection the whitespotted wedgefish will disappear. They point out that although this wedgefish is heavily exploited, there is a lot we do not know about it, so it is difficult to even put sustainable fishing measures in place or effective conservation measures. Collaboration on its protection therefore likely also means signatory States learning more about this at risk species. It might seem strange to list a species whose name is "common X" under the CMS, but if we take a look at the IUCN Red List, we can see by its Endangered status that it is not really all that common. There were actually four separate proposals submitted for the common guitarfish - one by the Government of Israel, one by the Government of the Islamic Republic of Mauritania, one by the Government of the Republic of Senegal, and one by the Government of Togo. Since the proposals were almost identical, they were assessed together. Like the whitespotted wedgefish, the common guitarfish is also a ray that is targeted for its fins (but also its meat). Although common guitarfish used to be…well common… in the Mediterranean, they have largely disappeared due to targeted fishing as well as high levels of bycatch. So grim is their situation in the Mediterranean, they have been declared one of the most endangered fish in the Mediterranean Sea. Elsewhere the same problem - targeted fishing and bycatch has seen populations decline rapidly. Some of the last stands for the common guitarfish remain only in West African waters of Guinea-Bissau, Senegal, and Mauritania. Habitat loss is also a growing problem, particularly in the Mediterranean Sea where trawling as well as development could be threatening the shallow-water habitats that the rays are found in. Also rather like the whitespotted wedgefish, there is much that we do not know about the common guitarfish. The development of an effective conservation plan across the animals range also means learning more about the species - and monitoring the outcome of any conservation actions that States put in place. This large seabird wanders far and wide across the Pacific, but only breeds on one small island - Christmas Island which lies off the north-west coast of Australia. Historic phosphate mining on Christmas Island resulted in the destruction of nearly a quarter of the bird's breeding grounds, whilst dust fallout from mining operations made other parts of the Island uninhabitable. Mining no longer occurs near the frigatebird's breeding area, and the creation of a reserve helped reduce poaching of the breeding birds. Unfortunately, non-native species which have been introduced to Christmas Island are altering Island ecosystem. We don't know what these changes will mean for the birds. Sadly the Christmas frigatebird is listed on the IUCN Red List as Critically Endangered. It isn't just the limited breeding area on a heavily impacted Island that has put this frigatebird in such bad state - nor the only reason why the Government of the Philippines called for it to be listed. In Indonesia and Malaysia fishers actively hunt the birds. Even when they aren't being targeted, they are also susceptible to being accidentally caught in fishing gear. On top of this, many parts of South-East Asia has a marine pollution problem that is putting the birds at risk. To add to the birds' trouble, outside of Christmas Island where the birds roost on land, the birds are facing habitat loss and poaching. Alongside reducing marine pollution and improving protection on Christmas Island, the Philippine Government hope that listing under the CMS will result in better protection on roosting sites and in the key places where the birds like to feed throughout their range. There are several sub-species of black noddy - seabirds that live in the tropics and subtropics - in the world, but this particular black noddy only breeds on two small islands at Tubbataha Reef in the Philippines. Although the species as a whole has the favourable IUCN Red Listing of Least Concern, this particular sub-species is classified as Endangered under the Philippine Red List of Threatened Species. The situation is dire for Tubbataha' s black noddies. Over the next 10 to 15 years, the population is projected to decline by move 70%. The Philippines recognise that a large contributor to the bird's decline has been the loss of breeding habitat which still continues today. Whilst the breeding habitat lies in their jurisdiction (and indeed they are implementing management plans), they hope that their accepted proposal to list the black noddy under the CMS will mean that Indonesia and Malaysia - which are home to the bird's outside the breeding season - will help ensure that the birds receive full protection throughout their range and help prevent that 70% forecasted decline.